Home Blog Black Churches Have Collected $420 Billion? Black Churches Have Collected $420 Billion? Harlem World – LiveSteez research shows that Black churches, in aggregate, have collected more than $420 billion in tithes and donations since 1980. With a Senate investigation into the finances of several mega churches underway, the “Prosperity Movement” has been the target of mounting criticism from inside and outside the Black Church. 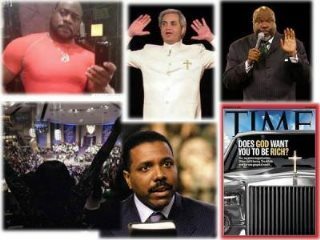 Specifically, the affluent ministries of The Reverend Creflo Dollar, Bishop Eddie Long and others have drawn the attention – and ire – of some clergy and laypeople alike. Researcher Henry E. Felder’s study of Blacks’ donation habits demonstrated per capita spending of $508 per year in 2009 dollars. Another source, Tyler Media Services, estimated that Black Church revenue approached $17 billion in 2006. One church, the Reverend Dollar’s World Changers, reported $69 million in 2006 income, according to the Atlanta Journal Constitution. Mainstream politicians and Black community leaders are demanding a better accounting of the “return on investment” offered by churches to the communities that fund them. Meanwhile, legions of faithful churchgoers defend their pastors and accuse their detractors of applying a double standard that ignores the largesse of wealthy, white televangelists, while underplaying the economic development and social service functions provided by the Black Church. “The church has gotten caught up in materialism and greed, a lifestyle. Many ministers today want to live like celebrities and they want to be treated like celebrities. In other words, instead of the church standing with the community, the church has become self-serving. It has strayed away from its mission” according to Dr.Love Henry Whelchel, professor of church history at The Interdenominational Theological Center in Atlanta. Few people – not even the ongoing Congressional investigation by Senator Chuck Grassleyaccuse the mega church pastors of outright larceny, and congregants generally approve of their pastors’ luxurious lifestyles. However, in a blatant recent example, a father-son pastor team, 76-year-old Richard Cunningham of Moreno Valley and his son, 52-year-old Philip Cunningham of Laurinburg, N.C., pleaded guilty to felony grand theft and fraud charges. The younger Cunningham also pleaded guilty to forgery. Over five years, prosecutors say, the Cunninghams stole from Calvary Baptist Yorba Linda Church and School bank accounts and used the money to buy time shares in Hawaii and Palm Springs, golf club memberships and a Cadillac. Prosecutors say the men have paid $3.1 million in restitution to the church. – How often and how much do church leaders take advantage of the faith of poor black people? -We will investigate and indentify the churches they are showing a strong return on investment that goes beyond inspiration. – What does the black community have to show for the $350 billion in tax free dollars? – Expert analysis on what could potentially be done with such a huge amount of money and how it could improve the state of our communities. – Why do some church leaders refuse to participate in the Grassley congressional Investigation, which requested the financial records of several mega-churches. Previous articleCan the Black community change the face of the music industry? There are approximately 39 million Blacks in America. 85% of them are religious, most of those being Christian but just 7% of Blacks belong to “historically black Protestant churches,” according to polling by the Pew Forum. That comes to 2,730,000 members of traditionally black Protestant churches. $420 billion / 2.73 million black Christians = $153,846 per black Christian since 1980. It’s been 33 years since 1980, of course. So that’s an average of $4,662 per black Christian per year. Can you imagine returning $153,000 to every member of black Christian churches? “Where no Vision the People Perish” Prov. 29:18a. -I know that I maybe a little late to the conversation, but there is Hope, and it’s called the Visions Of Hope Ministries. I need like minded people of God that are willing to work to revitalize the Black Communities to restore the Church to its rightful place, for a more information contact me Minister Joseph williams at [email protected].